Reuters UKBritish Prime Minister Theresa May called on Tuesday for an early election on June 8, saying the government had the right plan for negotiating the terms of Britain's exit from the European Union and she needed political unity in London. Reuters UKPrime Minister Theresa Maycalled on Tuesday for an election on June 8, saying Britain'sopposition parties risked worsening her negotiating hand indivorce talks with the European Union by opposing her Brexitplan. UK bookmaker Ladbrokes says odds are that Conservatives are 1 to 10 to take the most seats in UK general election. British Prime Minister Theresa May called on Tuesday for an early election on June 8, saying the government had the right plan for negotiating the terms of Britain's exit from the European Union and that she needed political unity in London..
"There is no doubt that the Conservatives are in a strong position in the opinion polls..."
"That clearly would be enough to give Theresa May a quite substantial majority." "In a sense she's essentially saying the reason we need to have this (election) is because 'we need a government that has a clear majority that's committed to the version of Brexit I want'." "For the moment at least it is not being seen as particularly a negative." "I guess people see that this may give Theresa May a better majority. It is a politically astute move and it should provide more stability going over the immediate aftermath of the exit from the EU." Asked: Is the prospect of a slowing economy a reason for an early vote? "That probably is a factor in the sense that although the formal negotiations under Article 50 will have concluded by May 2020, we would most likely still be in a 'phased implementation' phase, which would indicate there would be a considerable degree of uncertainty about the fine print of trade prospects." "The economy may well be a factor, but I suspect the Conservatives' lead in the opinion poll ranks above that." Prime Minister Theresa May is trying to force Britain into a "hard Brexit" by calling for an early election on June 8, Scotland's First Minister Nicola Sturgeon said on Tuesday. "The (Conservatives) see a chance to move the UK to the right, force through a hard Brexit and impose deeper (public spending) cuts. Let's stand up for Scotland," Sturgeon, whose party seeks independence from the United Kingdom and opposes Brexit, said on Twitter. Theresa's May's call for a snap election is a Brexit plot twist worthy of master of suspense Alfred Hitchcock, the EU official running negotiations on Britain's withdrawal said on Tuesday. ReutersBritish voters can use a snap election called on Tuesday to show what kind of relationship they want with the European Union, the European Parliament's point-man on Brexit, Guy Verhofstadt, said in a statement. British Prime Minister Theresa May said on Tuesday that it was during a walking holiday in Wales when she decided she would hold an early election to strengthen her hand in talks with the European Union. May told ITV news: "Before Easter I spent a few days walking in Wales with my husband, thought about this long and hard and came to the decision that to provide that stability and certainty for the future that this was the way to do it, to have an election." British PM calls election: What next? 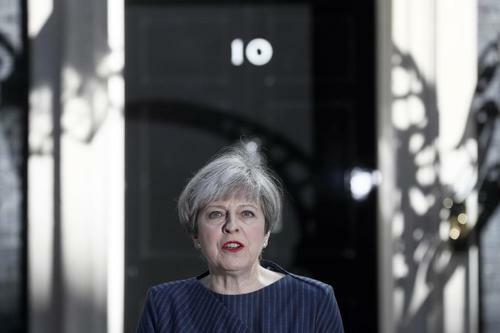 ReutersBritish Prime Minister Theresa May on Tuesday called for an early election on June 8. Here are the steps needed before the vote happens. British Prime Minister Theresa May's Conservative Party has a 21 point lead over the main opposition Labour, the joint highest on record, according to an opinion poll on Tuesday conducted after May announced a June 8 election. The ICM/Guardian poll of 1,000 people showed the Conservatives' vote share stood at 46 percent, up 2 points from a poll conducted over the weekend, with Labour on 25 percent and the Liberal Democrats on 8 percent. "As we enter this campaign it's clear that Labour have an electoral mountain top climb, and its leadership appears to have left its ropes and crampons at base camp," said Martin Boon, director of ICM Research, in a statement. Around three in five respondents said May was right to call a general election, the poll showed. ICM's survey dates back to the early 1980s. British Prime Minister Theresa May could win a landslide majority of 114 seats in a June 8 election, The Times newspaper reported, citing YouGov polling data. Ireland fears British Prime Minister Theresa May's call for an early general election in June could damage chances of resolving the political crisis in Northern Ireland, the Irish Republic's foreign minister said. Running contrary to the norm on shock election announcements, the pound's steep gains on Tuesday point to hope among investors that the June poll may stabilize domestic UK politics as the country faces its biggest challenges in half a century. British PM May says holding election now will provide stability for longer period. May says planned 2020 election would have clashed with crunch time in EU talks. British PM May says it is possible and we should be able to complete EU negotiations within two years. British PM May says there will be no second referendum on EU membership. British PM May says we won't be doing television debates in election campaign. Reuters UKBritish Prime Minister Theresa May said on Wednesday that holding an early election on June 8 rather than waiting until 2020 would avert a situation where she would face a crunch time in EU talks and a domestic election at the same time.